REPORT OF ANNA POOJA - ( 04.07.2014) Every small services made to others will awaken the power sleeping in our mind and heart was said by Swami Vivekananda and in the same way Vivekananda Kendra is functioning. On 04.07.2014 during the maha samathi day of Swamiji, Anna Pooja was celebrated in the Kendra campus of Vivekananda Kendra Kanyakumari. 20 tons of rice which was collected in Tirunelveli and Kanyakumari districts was heaped up and the Annapoorani statue was adorned. The function was started by lighting the lamp by Smt. Indra Ganesan and Smt. Rajalakshmi of Rajapalayam well wishers of Kendra. Afterwards the “ ANNA POORNA STHOTHRAM” composed by Aadhi Sankara and11th chapter of Bagavath Githa chanted by Kumari.Nagajothi, Kendra worker and followed by all the people. The completion of the event was done by Smt.Mathurammal and Smt. Muththamil Selvi Ayyappan by taking the Aarathi. “To serve man is to serve God, For the progress of our nation For the spread of our Culture For the survival of humanity We shall pray, We shall serve” By saying the above sacred words Sri. Annaya Pandian from Tenkasi Kendra well wisher handed over the bag of rice to Vivekananda Kendra Vice President Sri. Balakrishnanji . Sri.N.Krishnamoortiji Editor of Vivekavani gave his blessing speech. A new book in the name of “VIVEKANANDA FOR VALUES” written by Sri.N.Krishnamoortiji was released by Sri. Balakrishnanji and Sri. Mohan Pattel from Shenkottai received the book. The same book was also given to Sri. S.K.Subramanim Vallioor Vivekananda Kendra Vidyalaya, Sri. Varadarajan of Surandai and Sri. Abraham principal Vivekananda Kendra Vidhyalaya Kanyakumari and Mrs.Gowri Raja Sekar Saha Sanjalak Thoothukudi Branch. In continuation of the function educational aid was given to 24 deserving students from sourthern three districts worth of nearly Rs. 70,000/-. 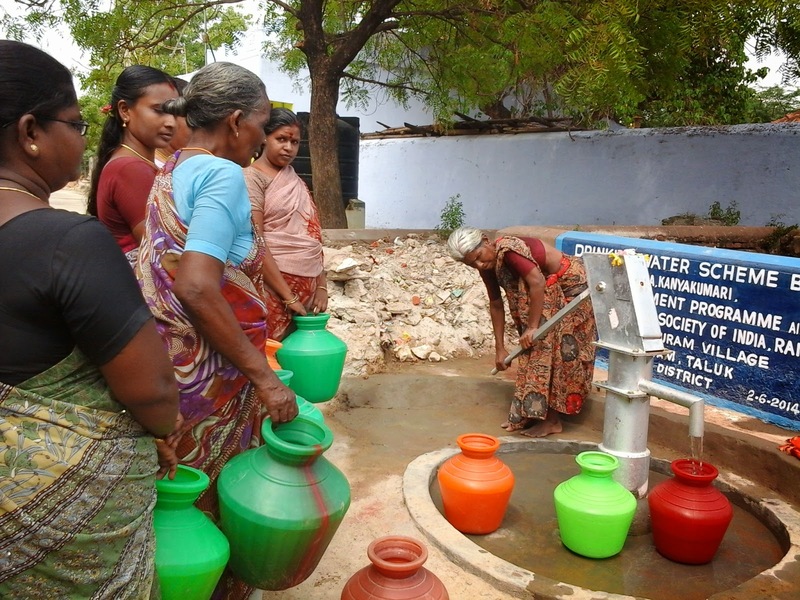 The aid was sponsored by Dr.Maria Pia Maagi - Italy and Sreganesh Nandagopal - Chennai. Sri.Paramaguru Vivekananda Kendra Rural Development Programme, Kovilpatti incharge gave vote of thanks and Kumari.Leela sang the Kendra Prarthanai and the function was concluded. In this function all the balwadi teachers, Ayas, Kendra workers, Vivekananda Vidhyalaya students ( girls and boys) and Kendra well wishers participated. Nearly 1200 people participated. All the people served noon prasadam. In the evening cultural programme from Mananeeya Eknathji’s life by RDP workers. Thus we need not learn the art and the science of organization newly from anybody else, as it was originated and set in motion by our foreseeing forefathers in the most perfect and ideal manner, but we have forgotten it. It is our own precious heritage presented in the new fashion by the West. We have unfortunately, through the blind and irrational following of others, lost the technique of coming together and working together for the furtherance of a sacred cause. One outstanding feature of our organization is that it is a Non-Sannyasi or Lay-Order. Progressively the life-worker cultivates and develops renunciation through steady efforts. He has left his personal attachments for his near and dear relatives and friends to extent that he is lost to every one of them. He gives a training to himself as well as to his near or dear ones, so that they also forget him in due course. People must feel on critical scrutiny that the moral rectitude and the essential attitude of a Sannyasi towards life are equally present in the worker. We call our order a Non-Sannyasi Order and not a household as well as Sannyasi order. Taking into consideration the strength and capacity of an individual, he has done the maximum renunciation within his reach. He takes three vows (i) Shuchita( or purity, and not of celibacy necessarily) (ii) Aparigraha or non-possession, the guiding star of a life either married or celibate; and (iii) implicit obedience to the organization, a resolution of mind to follow rules, regulations, policy etc. of the organization most rigorously. Calling Young men and women with an urge for spiritually oriented social service. If you are a Graduate or higher secondary passed with experience in any trade or technical profession, below thirty years (this may be relaxed), free from family encumbrances, and willing to remain unmarried for at least five years, satisfied with simple living and ready to serve anywhere in India.It is not a salaried job, but provides ample scope for one’s own unfoldment in national interest. • Becoming a Life Patron/Perpetual Patron. • Donating generously for any of our Projects. • Enrolling your friends as Patrons. • Subscribing to our Journals. • Purchasing our publications, Greeting Cards, Calendars and Diaries. • Enlisting to your friends as participants in our Spiritual Retreats. • Contacting our nearest Branch Centre and involving in the activities there. • Offering your self as a KaryaKarta of Vivekananda Kendra. • Motivating qualified young men/women to work as teachers in our schools in ArunachalPradesh/Assam. • Sponsoring the educational expenses of needy children studying in our schools in the North-East. • Contributing to the “Mid-Sea Monument Renovation Project”. • Motivating young men and women to join as Seva Vrati/Jeevan Vrati. You can serve humanity through the man-making and nation-building projects in education, culture and sustainable development and branches spread over all India. Come, dedicate yourself for the service of the nation as a full-time worker. It is not a carrier-but a mission, your yogashema-well being-would be taken care of by the Kendra. Culture is a certain refinement of taste, enlargement of mind of the whole personality. Culture is a pursuit of our total perfection by means of getting to know, on all the matters which most concern us. The best which has been thought and said in the world, we come under the purifying and uplifting influence of highly cultured personalities and such close contact will result in our gaining something of their lofty culture. In order to encourage the children in the age group of 6 to 16 years, to study books on our rich cultural heritage and to shape their character, cultural classes are held in village temples, where they are taught patriotic and devotional songs and stories from scriptures.The classes are handled by trained volunteers. The syllabuses have been framed for such classes, and books have been prepared. The examinations are held annually and winners receive books as prizes and certificates. In cultural classes we conduct personality development classes. Personality development is for two purposes: one is to achieve success in material life and the other is to achieve success in spiritual life. For both purposes it requires to have balanced and developed faculties like physical body with sharp sense organs and working organs, concentration, memory, sensitivity, emotions like love and enlightened ego, will power, confidence, courage, good discrimination, intelligence, and many others. Power, fame or money or all the three are one set of components of life. It may seem that they are opposed to spiritual growth, but they are important for getting success in material life. Man can use them for the betterment of society. Simplicity, knowledge or happiness or all are three are another set of components of life and they are important for getting success in spiritual life. These can be achieved only by the development of personality. In 230 Samskara Vargas, 6932 students participated. The students were taught about the values of Indian culture through games and lessons. The feelings of oneness are strengthened among participants through patriotic songs and games. Chanting of Sri Rama Jeya Rama Mantra was held during Deepa Pooja, Shivalinga Pooja and also during all monthly meetings by PrePrimary school teachers, childrens,Cultural class students and workers. Every month nearly 3,16,250 times mantras were chanted in 125 localities. 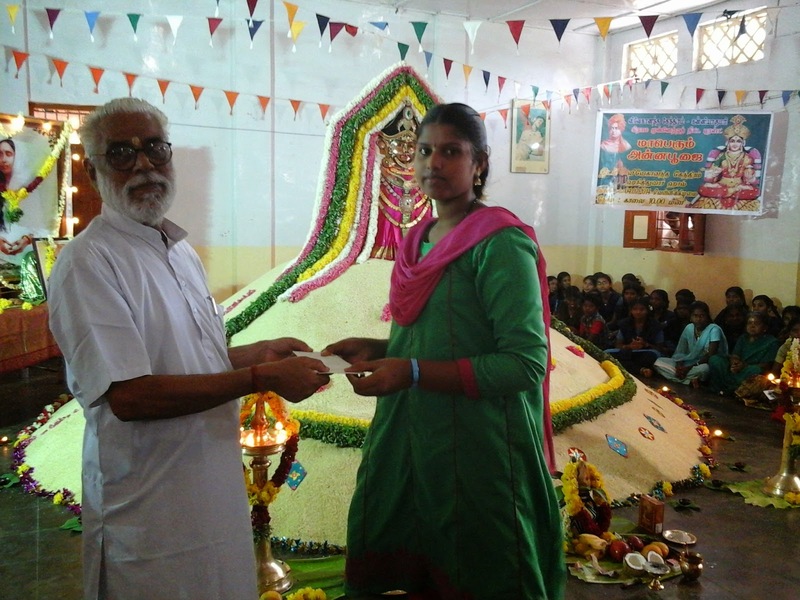 Religious conference was conducted at Andarkulam in Kanyakumari district and Sivagiri Balamurugan Temple in Tirunelveli district in which 191 students from 17 Bala Samskara Varga classes were participated and they involved in dramas, speeches, songs, elocution and divine shows competitions etc. Culture means an all round and harmonious development of personality. We have a harmonious and perfected personality when all the faculties of man, intellectual, aesthetic, moral and religious are adequately developed and refined none of these are made to starve. The Kendra make a concerted attempt to educate the school-going children in value based, culture-oriented way of life. They participate in quiz, recite passages, render songs and paint pictures on cultural themes, tell stories of great men and their sayings on patriotic topics etc. These provide the students, teachers, parents and people ample opportunities to study great literature. Books are presented as prizes. Competitions are conducted at various levels union, district and inter-district.Winners of district level competitions are invited to Kanyakumari for Camp. Every year nearly 2000 schools send 2,00,000 participants to competitions. In this month Rural cultural competitions were held at 8 places in the southern 5 districts of Tamilnadu, 1196 students participated from 62 schools. Also 50 teachers and 85 parents attended these competitions. To promote an awareness of our noble heritage, to encourage patriotic fervour and to motivate a spirit of sacrifice and service, students of higher secondary classes and colleges are invited to participate in competitive written examinations. Books on our epics, history, great men, etc. are prescribed and distributed through educational institutions for this purpose. There is very good response from the students. About 300 girls and 100 boys who have obtained very high marks are selected and invited to attend four days residential camps. This programme is very popular and students even from professional colleges and post graduate students appear for the examination. One day camp was held at Pandalkudi in Virudhunagar district and 76 students were participated. Personalty Development Camp was held at Valliyoor in two places and 144 students were participated. • Yama- Way of life or general discipline. • Niyama- A Special or particular self-discipline. • Praanayaama- Control of breadth and vital functions. • Pratyahaara- Self-withdrawal or detachment. • Samaadhi- Super consciousness and complete enlightenment and merging with the Creator. "Women is the builder and moulder of a nation's destiny",(Rabindranath Tagore).According to Gandhiji, "Women is the incarnation of Ahimsa". In Rig Veda, a married woman was treated as an equal partner in the family's life and was considered more as a companion of her husband than as his servant or subordinate. In other words, Indian tradition has been characterized by a deep respect and regard for womanhood. A woman should be in the nature of a university that trains younger generations. It is this ideal that must be at the bottom of every action tending to improve the lot of women. Though their condition at the present time is thousands of times better than it was earlier much more has to be done. A larger percentage of women must be educated and made to realize that they too should and can work for the development of the nation, standing shoulder to shoulder with men on a footing of equality without however forgetting that on such an effort they still retain the traditional ideals of Indian womanhood of modesty, virtue, peace, fortitude and sacrifice. Under Rural Development Programme Kendra runs 4 Tailoring Units, in the districts of Kanyakumari(2), Tirunelveli (Valliyoor-2) to train girls in Tailoring. So far above 1000 girls have been trained and they are self-employed. Programmes for women and children include Deepa Poojas and bhajan Mandalies. 25 to 30 women gather every month in a local temple and worship lighted lamps as a symbol of Devi and pray for community welfare. The role of women in the society explained to them during these functions. Stories on great women of India are also told.Every month these programmes take place in 300 places involving 7500 rural women. Village level Deepa Poojas were organized in 245 temples with 9715 women participants, who offered their prayers to God for the welfare of all people. 80 women are serving in 4 Self Help Groups in Kanyakumari district. Four Tailoring units are functioning in Kanyakumari, tirunelveli districts and total attendance is 28. Shivalinga Poojas were conducted at two places in Kanyakumari didtricts and 112 members participated. Durga Pooja was conducted in Peyankuzhi at Kanyakumari district, and 37 women worshiped in Devi Pooja. On 25.12.2009, 1008 Deepa Pooja was held at Thoothukudi 739 women participated from 30 villages. Hunger is the most important instinct in man. As a matter of fact, it is the propelling energy of his life. There must be some hunger in every individual, for, even a gross hunger will gradually lead him to higher kind of hunger. A person without any hunger whatsoever is a dangerous creature in the society. A man must always be striving for something. An individual’s highest desire may for the time being, appear most insignificant to others, but he moves heaven and earth to achieve the same. People may strive for affluence, power, position and what not. Let them strive for the fulfillment of these desires for they are sure to go higher. It is a natural process and must happen. Thus hunger is a crucial factor in man’s progress. To encourage the common man to make a small sacrifice for others, the Kendra has initiated the Amrit Surabhi scheme. Cloth bags bearing the message of prayer for the welfare of humanity have been given to many families. The family members place a handful of rice in the back every day. The rice is collected every month for our service activities. Two major Anna Pujas are conducted on Tamil New Year Day and Swamiji's Samathi Day. 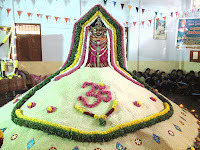 On these occasions, large quantity of rice collected by two special drives, are heaped together and worship is offered to Annapurna Devi by a very large gathering of rural development workers and the general public. The rice is distributed to various activity centres like pre-primary schools for use. On 19.12.2009 Sri Saradha Jeyanthi Day Anna Pooja was celebrated at Paramakudi in Ramanathapuram district in which 7,570 Kg. rice were collected. And also Anna Pooja was celebrated Aruppukottai in Virudhunagar district on 11.12.2009 in Periyanayakipuram and 18.12.2009 in Palavanatham in which 1,050 Kg rice were collected. A child in growing up, may meet and learn from different kinds of disciplines. The most important is what we might call the discipline of Nature or of Reality. When he is trying to do something real, if he does the wrong thing or doesn't do the right one, he doesn't get the result, he wants. A child meets this kind of discipline every time he tries to do something, which is why it is so important in school to give children more chances to do things, instead of just reading or listening to someone talk. 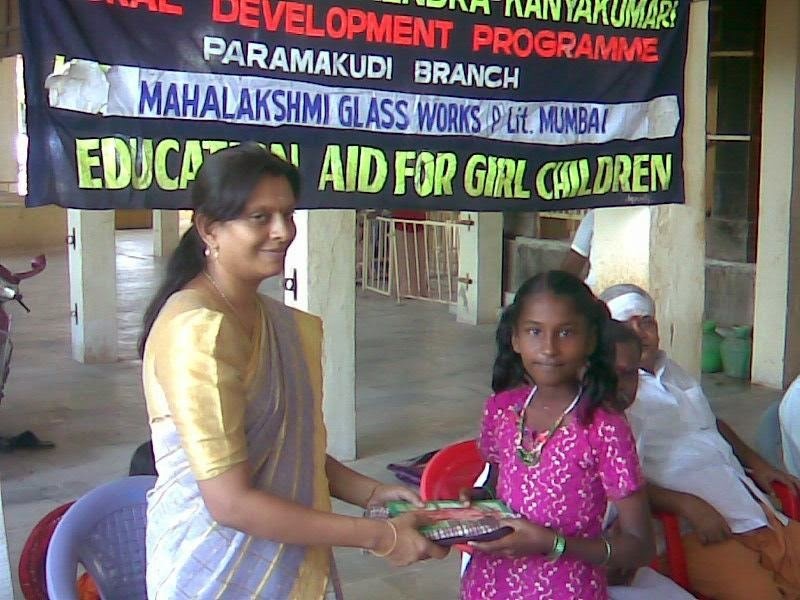 Under the Rural Development Programme Kendra runs 75 balwadis or pre-primary schools, in the districts of KanyaKumari(23), Tirunelveli(19). Thoothukudi(17) and Ramanathapuram(16). Each school has two Kendra-trained teachers and one Aaya for cooking meals for the children. Above 2500 children in our schools learn with prayers, stories and games. Based on our culture they receive expert approved nutritious lunch. The schools have a number of teaching aids and scientifically designed toys. Periodical medical check-up and monitoring of the children are the specialties of the schools. The community participation in these school programmes is heart warmed indeed. All the schools function in building donated by the community. A number of new buildings come-up symbolizing the collective will of the villagers. Parent-Teachers meetings are conducted very often. Vivekananda Jeyanthi Day, Universal Brotherhood Day, Independence Day, Republic Day, Geetha Jeyanthi Day and other important days are celebrated in the villages. No function or temple festival in these villages is complete without the local pre-primary school children presenting songs, stories or skits. Through 75 PrePrimary Schools, 1998 rural children were nurtured. In the schools, Malt, Hygienically prepared highly nutritive lunch were served with vegetables and evening vitamin rich cereals were provided to the children. Chanting of Sri Rama Jeya Rama Mantra will be held during Deepa Pooja, Shivalinga Pooja and also during all monthly meetings by PrePrimary school teachers, childrens, Cultural class students and workers. Every month nearly 3,16,250 times mantras were chanted in 125 localities. A truly educated person should be able to discriminate between the right and the wrong and should be able to work for the good. Education should train us to do thing, it should inculcate in us the right values of life. formation of the character on right lines. It's object is to bring children up in such a way that they will grow up to be truth loving, honest, brave, pure minded and unselfish men and women. Vivekananda Kendra runs 28 vidyalayas- 18 in Arunachal, 5 in Assam, 2 in TamilNadu, and Andaman. There are nearly 10000 students in these vidhyalayas.There are 433 students (53 in KanyaKumari, 78 in Valliyur, 221 in Thoothukudi, 39 in Ramanad, 42 in Aruppukottai ) studied with the help of VivekanandaKendra RuralDevelopmentProgramme. Reading a book is perhaps the greatest source of pleasure to a cultured person. Reading broadens his outlook, drives away his narrow prejudices and lightens up his mind with truth and knowledge.Books are our best friends. They never deceive or desert us in our hour of need like so many of our human friends. And the advantages once received from the reading of books remain with us throughout our lives. It is a great pleasure for us to read the books of the master minds of the past who have brightened up the ages with the strength and beauty of their vision.The Kendra publishes a monthly magazine in Tamil called "Viveka Vani" and in English called "Yuva Bharathi". Mananeeya Eknathji's "Sadhana of Service" and other books have been published in Tamil. Books on Gita, Karma Yoga, Hinduism, Puranas and Yoga have been published in Tamil and distributed at subsidized rates. Lakhs of copies of Quotations of Swami Vivekananda, Om Slips, Pictures of Swami Vivekananda have been printed and distributed freely. Through various branch centres and Book stalls, Rs.63501/- worth of literature books were sold. Subscriptions for 122 Vivekavani, Yuva Bharathi and three patrons were collected. The duty of the Indian to his community is that of working out social reforms with in its sphere. There is no community in India which suffers from a number of social evils, such as early marriage, the seclusion of widows, the absence of female education, etc. ; and there is no greater service that any one can render to his community than that of reforming abuses in the structure of its society. In the process of making money we neglect our social responsibilities and let the system deteriorate till we become victims ourselves. The Kendra undertakes relief works in the appropriate times of natural calamities.Certain examples are given below : YEAR PLACE HELP RENDERED 1982 Kollengode Rs.8200/- worth utensils to riot victims. 1982 Puliangudi Rs.65000/- worth roofing materials to riot victims. 1992 50 Villages Rs.6 lakhs worth utensils and provisions to flood victims. 1997 Paramakudi Rs.20000/- worth provisions to fire affected people. 1997 5 Districts Rs.1 lakh worth of cloths distributed to the needy. 1998 Ramanathapuram Rs.20000/- worth of utensils to riot affected people. 1999 5 Districts 300 children were provided with education aid to the extent of Rs.400/- each. As Swami Vivekananda has once remarked in one of his speeches, unless there is such an awakening, an individual continues to be child only. At the most, he can be grown-up baby, but he is not a human being, even though he may have added years to his life. With all the crude hungers, he continues to be an animal, perhaps a rational animal but not a man. One must realize the goal of human life and must stand face to face with it. It is the destiny of man. Birth after birth he arrives and goes back and again returns but he does not become real adult unless he has the experience of that awakening, at least that awakening only. Without the knowledge of this goal, our life is only an aimless wandering. Every individual has self-interest but this self-interest must develop into an enlightened selfishness. Physiological hunger must transform itself into a higher variety of hunger and the enlightened selfishness must lead him to share all his joys with others in the society in order to reap more joy. There are ethical laws and rules of conduct prescribed by every society to satisfy this selfishness only. But the word ‘self’ changes its connotation in this context. The self does not remain limited to one’s physical and mental entities, but it goes on expanding its sphere of selfishness from individual from family, from family to society, from society to nation and ultimately from nation to the whole world. A devotee’s love of God should be expressed as the loving service to His creation. A devotee should love all human beings, animals, plants, and the entire creation as symbols of God. He should serve them, preserve them, conserve them. He should never harm and injure them. He should serve them with the same devotion he would show to God or the Guru. This type of loving service helps the devotee to express his love in a socially useful manner. Azhwars and Nayanmars undertook literacy, social, philanthropic and religious service in this sprit. Their work left a long lasting impression on the society. An unambitious man is a curse to the society. Every man must become mad after something and then only he can achieve something, that may be divine or mundane. The object may be small or big, but one must strive to achieve the goal and go ahead. Choice of the object is essential for this madness and it is such mad men only that have brought about all-round progress in the world. Madness is unavoidable. And when all other things of the world are meaningless to you, the highest hunger seizes you and your real life starts. To encourage the common man to make a small sacrifice for others, the Kendra has initiated the Amrita Surabhi scheme. Cloth bags bearing the message of prayer for the welfare of humanity have been given to many families. The family members place a handful of rice in the back every day. The rice is collected every month for our service activities. Anna Pujas are conducted on Tamil New Year Day and Swamiji's Samadhi Day. On these occasions, large quantity of rice collected by two special drives, are heaped together and worship is offered to Annapurna Devi by a very large gathering of rural development workers and the general public. The rice is distributed to various activitiy centres like pre-primary schools for use. Our Vivekananda Kendra workers have collected 1785 Kgs. of rice from the people of Kanyakumari, Tirunelveli, Thoothukudi, Ramanathapuram and Virudhunagar Districts under this scheme.